Planning a wedding is a tiny part of your new life with your beloved, but it's one that can cause a lot of stress. Between booking a venue and getting all the details in place, it's easy for an engagement to bring on anxiety rather than joy. Most married women still have their wedding dress. If there is a special woman in your life and it's logistically possible for you to wear her dress, ask her about it. Many people are happy to see their dress worn again, especially by someone they care about. Remember to consider any woman you love when you're thinking about this. You could wear a dress from your mother, sister, cousin, aunt, or even your grandmother. If you are close to your fiancee's family, maybe you could find a dress from someone on that side. Or maybe you have a close married friend or a mentor whose dress you'd love to borrow. Many people recoil at the idea of getting their wedding dress from a thrift store, but the truth is that you can often score a great deal if you're willing to put in the legwork. If you find a dress whose style you already like, that's awesome. But don't discount a dress you hate. If it's made from great fabric, like raw silk, the material alone is usually worth more than the thrift store price. And, for less than the price of a new dress, you can have a seamstress remake or change that dress into something you love. Even if you have your heart set on a designer dress, you don't have to pay full price. Check out Nearly Newlywed or PreOwnedWeddingDresses.com to find designer gowns that people are reselling. Often, these are a fraction of the price the dress would cost new. Try on dresses in a store before you buy anything online, so you know what size you're looking for. Remember — good seamstresses can almost always make a dress smaller (though it's harder if it has a lot of embellishments), so if your size isn't available and you don't want to wait, try buying a dress that's a little too big. Even after you pay your seamstress, it will likely be cheaper than buying new. Specifically, BCBG, J. Crew, Ann Taylor, and Anthropologie all have bridal lines, and most of the dresses they offer cost less than you would pay at a bridal boutique. Some of these dresses are simple, so you might want to think about adding some details of your own. But when the dress itself costs less, it's easier to afford the alterations that will make it specifically yours. If you happen to find a dress you adore as-is, you'll end up with the gown of your dreams for even less. Once or twice a year, the top sample sale sites (think Gilt, Ideeli, and Rue La La) offer bridal collections at a huge discount. Designer dresses can go for 50%-75% off the normal retail price, so you can get a gorgeous dress for a steal. You will have to act fast when these sales go live, because they often sell out quickly. Know what you want and when the sale starts, and be ready to buy as fast as you can. If you miss the sale, it may not come around again before your wedding. Some fabrics are more expensive than others (think raw silk, for the most costly). Fortunately, there are many cheaper fabrics that look spectacular and cost a lot less. In fact, technology has come far enough that no one but an expert will be able to tell the difference between an expensive fabric and a cheaper one unless they are up close and personal with your dress. Synthetic or blended fabric will usually cost the least, but even taffeta and chiffon will be cheaper than silk or real lace. If you find a dress that costs too much, you may be able to purchase a cheaper but similarly textured fabric and have a seamstress make the dress for less. Be sure to consult a seamstress before you buy any fabric to make sure it will work with your plan. Winter and summer are when designers get ready to distribute their new lines. Retailers often have to make room for these new clothes, and they do that by selling their old stock and store samples at drastically reduced prices (sometimes up to 80% off!). You will usually need to visit these stores directly and prepare yourself for some craziness while you're there, but it will be worth it if you have your heart set on a particular dress and you can get an amazing deal. 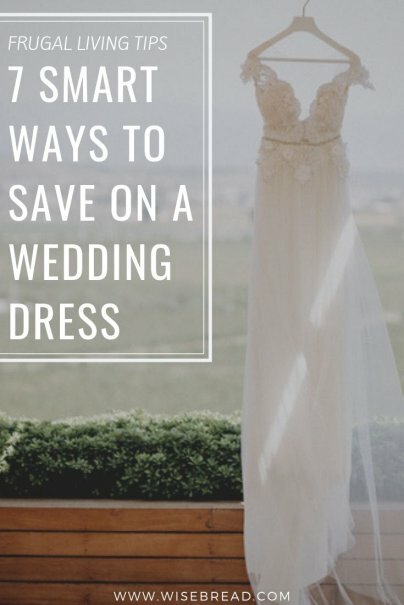 How did you save money on your wedding dress? Would you recommend others do the same? Check the online sites for bridal boutiques for dresses that are cheaper than what they offer in the store. My sister dragged me into a David's Bridal to try on dresses first so I knew what style and size I wanted, and then I ended up ordering my gown from their website for hundreds of dollars less than the dresses they were promoting in the store.